PHNOM PENH, Cambodia (AP) — The leader of Cambodia's now dissolved opposition party was released on bail Monday after being jailed for a year on a treason charge, a government spokesman said. 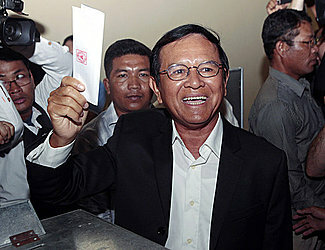 On Aug. 30, a court extended Kem Sokha's pre-trial detention by six months. Cambodia's courts are considered to be heavily politicized and under the influence of Hun Sen's ruling party. Last week there were hopes among Kem Sokha's supporters that he might be released because in the past two weeks more than 20 people imprisoned for political activities have been freed with pardons or on bail.